Mode of production: They work in experimental mode with a small amount of grapes, hand-processed on a basket press. 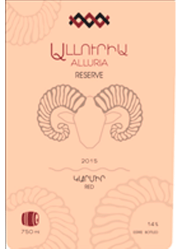 The winery uses only wild yeast, fermentation and aging is carried out in barrels from the Karabakh oak. Wines I stand in barrels for 18 months and after bottling are additionally kept in bottles 3 months. Tasting notes: Wine of not transparent dark ruby ​​color. In the aroma of bright berry tones: ripe cherries, cherries, blueberries. The taste is full-bodied, with tones of red ripe cherries and prunes. The aftertaste is long, astringent, with a berry tint.